Atlas Shrugged business advice is terrible. 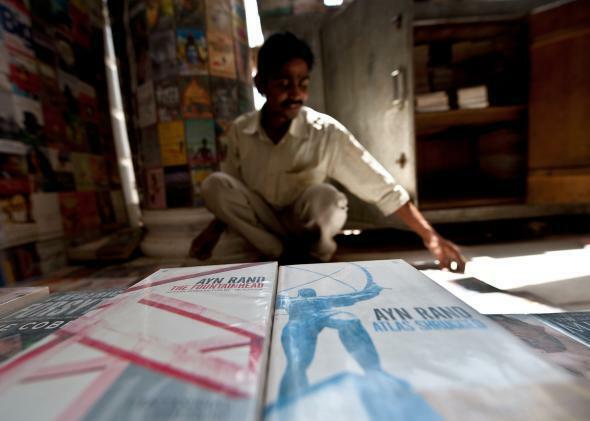 An Indian bookseller arranges Ayn Rand’s novels at his roadside stall in New Delhi in 2012. To a certain type of business person, “Atlas Shrugged,” Ayn Rand’s behemoth novel about the mysterious John Galt, is something of a holy text. PayPal co-founder and early Facebook investor Peter Thiel counts it as his inspiration. Lululemon founder Chip Wilson is also a big fan; the company got significant flack for printing the phrase “Who is John Galt” on its bags. Uber CEO Travis Kalanick is a Rand devotee as well, at one point using the cover of “The Fountainhead” as his Twitter avatar. Given their success, these businessmen must rely on the book as more of a personal narrative than for many of their business decisions. Because, for a novel that’s at least partially about business, “Atlas Shrugged” offers some really bad business advice. There are good points, like the idea that successful businesses have to pick the best and most efficient partners over friends and that competition is usually a good thing, but there are lots of very bad ones. We’ve picked out a few of the most famous quotes, passages, and ideas that could lead would-be devotees astray. “Atlas Shrugged” is particularly popular among people, including some politicians, who object to the way monetary policy is currently conducted and favor a return to the gold standard or “hard money.” They often point to one passage in particular—copper titan Francisco D’Anconia’s famous “money” speech. The idea that the gold standard is more stable or objective is wrong. It’s actually quite unstable and was definitely bad for business. The current actions of the Federal Reserve, many of them only possible in the absence of the gold standard, helped save the country from economic collapse and support the economy as it continues to grow. Ben Bernanke gives a more detailed debunking of the gold standard, which is worth a look. Advocating a return to hard money is terrible business advice, because it’s not only unproductive and wildly unlikely but would also bring back the huge fluctuations in inflation that modern monetary policy has managed to largely end in the Western world. The book portrays people who own and succeed in a business as being some combination of fortunate and brilliant, and above the rest. But having made a lot of money doesn’t make you inherently superior to other people. That’s an attitude that can very easily lose you friends, customers, and the goodwill of your employees. Work hard, enjoy what you earn, and if people criticize you for being greedy, prove them wrong or bear it with grace. But don’t make pronouncements about your superiority and the inferiority of anybody who hasn’t made it to the top. Helping people achieve instead of looking down on them is true leadership. Any leader with the mindset described there is probably going to stay pretty lonely. Rand’s portrait of an ideal society of sorts is one where the word “give” is banned. The book espouses the idea that people can only be motivated when they give something in return for something else, usually labor or money. That’s an idea that research and reality frequently prove wrong. Many people are motivated by money, but many others are better motivated by doing something they think is worthwhile or by helping people. Employees and customers are going to be of both types, and any business owner who can’t understand or acknowledge that is going to end up losing out on talent. The “whining” person D’Anconia describes, he says, “is any man who proclaims his right to a single penny of another man’s effort.” Obviously, that’s dramatized. But it reflects an idea that anyone who takes assistance is somehow contemptible and is someone people in business should strenuously avoid. Government, as portrayed in “Atlas Shrugged,” is a caricature, existing pretty much exclusively to demonize and take from more successful people. But the foundation of any business’ success is infrastructure, property laws, and particularly intellectual property laws. Government provides all of that and a whole lot more. Businesspeople might be irritated by some of what government does, but they’d be a lot worse off without it.